This vase is 24cm tall and 7cm across at the base. It bears a "Jian Ding" stamp at the bottom but with no other mark. I guess it may from Yongzheng period. But according to Gotheborg, 99% of the items bearing a "Jian Ding" stamp is no older than mid 19th Century. I made my guess based on the rose-like red color painted on the horse, as well as on the simplified painting style, and the elegant shape of the vase. 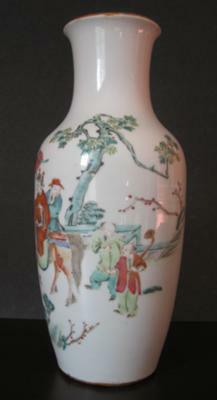 Comments for Age of this vase? The pictures are too small to say anything for sure. The only I can say that with this decoration it can only be Tongzhi reign or later. 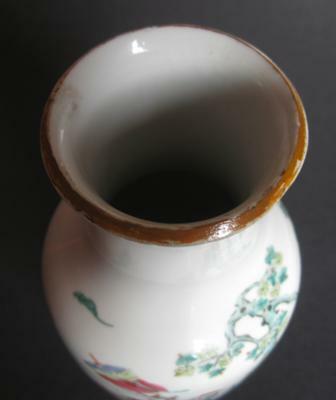 Yongzheng porcelain decorations are different. I have several questions. Why is the jianding seal this color. Did someone paint another color on it? Did you look for a seal underneath the jianding seal? Actually, a seal has no provenance value because it only means it was inspected and is allowed to be exported. It does not mean that an item is genuine. I wonder if you could upload close-up pictures of faces and a partial decoration? Also a close-up of the jianding seal and the top rim. The current pictures are too small to see them clearly, I'm afraid.